Lester William Polsfuss (a.k.a. “Red Hot Red,” “Rhubarb Red” and ultimately “Les Paul”) was a precocious child. At age 12 he discovered that by punching additional holes in player piano rolls he could get the instrument to play new melodies and harmonies, effectively “overdubbing” parts onto the originals. 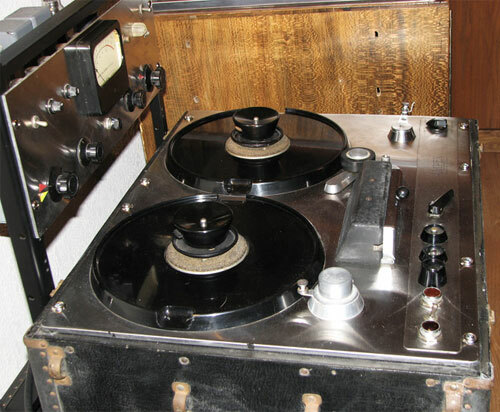 Paul also fashioned a mechanical disc recorder at about that same time, using a lathe in his father’s garage. A few years later he made two-track recordings on another homemade lathe by recording one track onto an acetate disc as usual and then cutting a second groove by placing the cutter head between the grooves of the first one, a questionable process that he admitted hadn’t worked that well. Those were only a few of the early indications of where the youngster was headed. Paul created uncanny arrangements of “Lover” and “Brazil” by using a primitive form of multitracking involving two modified cutting lathes, simple but brilliantly employed electronics and a large quantity of blank acetate discs. Paul played all the instruments on these “multiples,” as he referred to them, including drums and percussion, quasi bass, rhythm guitar, lead guitar, and several additional guitars that played back at double-speed and consequently were pitched an octave higher. These unprecedented recordings blew the minds of millions of people — industry professionals and lay listeners alike — upon their release in 1948. Paul used a four-channel mixer built by his friend Wally Jones. It was specifically designed to match the input and output levels of the various pieces of gear, resulting in the quietest possible performance. The mixer’s guitar input fed a custom tube preamp with a 5 kHz boost that added brightness and bite. High frequency loss still posed a problem, however, as a result of the physical properties of the acetate discs themselves. An additional high-frequency issue Paul encountered was that after multiple bounces the tracks recorded earliest would sound progressively duller than the more recently recorded tracks., So he would adeptly calculate the rate of brightness loss on a given sequence of tracks and boost the highs up front during recording to compensate. To achieve maximum presence and clarity he kept the signal as hot as possible without inducing distortion, which he accomplished by what might be thought of as manual limiting. The Wally Jones mixer was fitted with a decibel meter instead of the more typical VU meter, and Paul would eyeball it while playing, making minimal adjustments to his volume as necessary. Recording the double-speed guitar parts required as much musical prowess as it did technical savvy. Paul ran both lathes at half speed while recording, which meant that he had to play along with backing tracks that were playing back at half speed and an octave lower. Should you doubt the difficulty of getting the tempo and phrasing right while doing this, give it a try some time. Then, listen to, say, “Caravan” and “What Is This Thing Called Love” and imagine conceptualizing and playing all of those complex sped-up runs and harmonies. 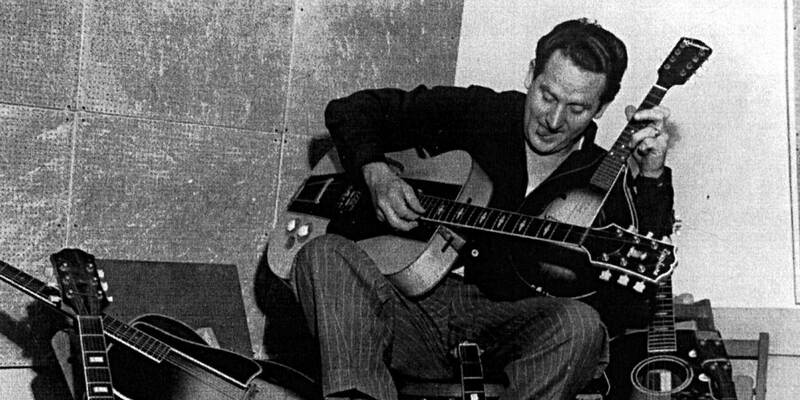 Les Paul - "What Is This Thing Called Love"
Once the recording was returned to normal speed, the new guitar parts would play back twice as fast and an octave higher. And to simplify making the speed changes necessary to accomplish this, Paul had his lathes modified to run accurately at both 78 rpm and 39 rpm, and to switch easily between the speeds. As astonishing as his deft track layering and high-speed accompaniment were, however, Paul had still more tricks up his sleeve, such as the delay effect on “Caravan” that he purportedly achieved by tapping the playback needle after the cutter head so that whatever had just been recorded would play back a moment later, and recording in reverse. Paul also claimed that he “would start the two cutters out together, and then just slow one down and speed it up ever so little” to create phasing and flanging effects, though doing that would presumably require having yet a third lathe to record to. One is hard put to identify either effect on any of Paul’s acetate-disc recordings from that period. In 1949, Paul’s New Sound was elevated to another level when his friend, mentor and former employer Bing Crosby gave him an Ampex Model 300 reel-to-reel tape recorder, which he wasted no time in modifying. By adding another playback head before the existing erase, record and playback heads — so that the part recorded initially was played back by the first head, and simultaneously dubbed to the record head as it fed headphones — he could make “sound-on-sound” recordings with a single machine. Although tape sounded much better than acetate discs, there was a daunting downside. “The only drawback to this — which wasn’t a drawback as I look back — was that if you were recording 12 parts, and you blew the 11th part, you had to start all over,” explained Paul. “That makes you a pro. When [Paul’s wife and musical partner] Mary Ford and I made ‘How High the Moon,’ we had 11 parts down, and Mary is singing her last part, and I’m playing my last guitar part, and a plane goes over — back to number one.” Paul eventually acquired a second Model 300, and overcame that restriction by bouncing between the two tape recorders much as he had done previously with the two lathes. Regardless of whether he used one or two recorders, however, the audio quality of the tracks he recorded earliest degraded significantly as he layered new tracks on top of them. That necessitated recording the least-prominent parts first and adding critical parts such as the “bass” (played on guitar), the main guitar and the lead vocal last. It required Paul to establish a good musical feel while playing, say, the fourth guitar part instead of a primary part. He also had to work out his typically complex arrangements in advance, so that the many parts worked musically and dynamically in terms of how they sat in the final blend once many layers had been recorded, and the earliest layers had faded and become less distinct. Ironically, while Les Paul’s role in developing the world’s first 8-track reel-to-reel tape recorder (commissioned in 1952 and delivered by Ampex in 1955) is frequently cited as his most significant contribution to recording, every single track of his most extraordinary musical work — from the advent of his New Sound to the last of his million-selling hits with Mary Ford — was recorded on either a mono tape machine or cut directly into an acetate disc. Barry Cleveland is a San Francisco Bay Area-based journalist, author, guitarist and composer. He was an editor at Guitar Player magazine for 12 years and at Mix and Electronic Musician magazines. His book, “Joe Meek's Bold Techniques” is a cult classic, and he contributed to “Whole Lotta Led Zeppelin: The Illustrated History of the Heaviest Band of All Time.” He has released five albums and composes music for film and television.